Great political ideas come, not from committees or from random samplings of the uninformed or semi-informed masses, but from intelligent and forceful leaders who can think them through thoughtfully, who can articulate them in a way that resonates with people, and who can set out an agenda to carry them into effective action. None of this is easy to do and it takes exceptional people even to make a credible stab at it. There is no need to bring in modern politics to illustrate this. Any glance through the Federalist Papers will quickly show to any informed reader that one can take very difficult and highly contentious topics (how to form a country, how to divide its power among different groups, how to limit its power decisively in furtherance of broader principles such as natural law) and make well-reasoned and even brilliant arguments about them in ways that compel people to action. The people who made those arguments were steeped in a lifetime of ideas and imbued with a strong philosophy about the principles of right government, and it showed in what they wrote - even when those writings essentially took the form of propaganda pieces (which is really what the Federalist Papers were). You won't get this from a website such as the one featured in this piece. You won't get it from Democratic Underground either. Leaders are leaders and hacks are hacks. The world offers the latter in abundance but good leaders are a precious few. This is not to say that normal, day-to-day people can't have good ideas or be intelligent in a political sense. It is to say that the intelligent articulation of such views won't come out in a mass setting and that is why political parties are ultimately driven by insiders (who are, one would hope, effective leaders) and not by soliciting random views from the street. An almost exactly analogous argument could be used to "prove" that Wikipedia would entirely fail . Replace "Great political ideas" by "High-quality encyclopedia articles" etcetera. I don't personally think much of Republican policies, but I'm glad they're at least giving things like this a go. I could wish, however, that they'd spoken with more people who have real insight into how social websites work. They could have started with the founders of Reddit, and a bunch of other YC folk. Yes, I'm well aware some people claim that Wikipedia has failed. But arguing with people who use "failure" to describe a site with Wikipedia's impact isn't worth the time. This isn't a valid comparison. A high quality encyclopedia article is not analogous to a great political idea. Particularly, an encyclopedia article is grounded in fact, while a great political idea may be considered an untested theory. Wikipedia is not a coherent entity, it's a bunch of tinpot dictators ruling over their own little fiefdoms. Wikipedia's success doesn't disprove the above statement, it just shows that the quality of one article is orthogonal to all the others. If only coming up with a great political idea was as easy as writing a high quality encyclopedia article. Quantitatively there are several orders of magnitude more article authors than great political thinkers. If we place all activities on a continuum based on intellectual difficultly, there's a point where crowd sourcing stops working. I think it's pretty clear where political thought stands compared to writing encyclopedia articles. "If only coming up with a great political idea was as easy as writing a high quality encyclopedia article." Coming up with a great political idea is probably pretty easy. The difficulty comes in convincing lots of people to make the sacrifices and compromises necessary to implement the great idea. That's why they call it politics, no? What's so "great" about a political idea no one cares about? Great political ideas come, not from committees or from random samplings of the uninformed or semi-informed masses, but from intelligent and forceful leaders who can think them through thoughtfully, who can articulate them in a way that resonates with people, and who can set out an agenda to carry them into effective action. Great leaders? Resonating with the masses? That sounds more like a primer on how completely awful (in the gas chamber/gulag/killing fields sense) political ideas come about. Most of the tolerable governments of the world have come about from a process of centuries of gradual refinement and consensus-building. Great leaders tend to screw things up more often than not. Great Britain made its way from monarchy to liberal democracy on its own and without the help (and occasionally with the hindrance -- I'm looking at you Mr Cromwell) of any "great leaders". The US constitution was just a somewhat refined offshoot of the British system. I agree. For a democratic system that is completely at odds with the US or UK one, take a look at Switzerland. While in most ways it operates as a republic, for their executive branch, they don't have one head of state. They have the Swiss Federal Council, which meets weekly, in secret, and has not been replaced since it was formed in 1848 (individual members have retired and been replaced in that time, of course). They also have direct democracy, where any citizen can trigger a referendum if they gather enough signatures in a certain amount of time. tl;dr - there's more than one way to run a country, and it's better to err on the side of not changing what works. But if you take this approach, you have to be mindful that just because you suppressed certain peoples' rights in the past doesn't mean you should in the future. The prohibition of minarets does not have anything to do with religious freedom. You can build as many mosques as you want and you are free to pray to anyone you like. It's only the minarets (the towers on top of the mosques) that most swiss people dislike because they just don't fit in the landscape. Of course, this prohibition is an overreaction (there are only a handful of minarets already and building restrictions are strict in general), but I can understand that people think that "Heidiland" isn't supposed to look like ... e.g. Istanbul. So "Postmodernism" is really a conservative idea? Probably not in general, but concerning architecture I would tend to say yes. Isn’t it an important part of “postmodern architecture” to melt premodern/traditional designs with modern ones? So, conservative ideas/values seem to have some influence. > The US constitution was just a somewhat refined offshoot of the British system. I think it's important to point out that there is, in fact, very few similarities between the U.K. government, especially at the time, and the U.S. government. The U.K. uses a parliamentary system of government without a written constitution. There is a single, essentially all-powerful, legislative body with no separate executive. They can literal change the structure of government by passing a law due to the lack of a constitution. The government is structured as it is due to tradition. The only real similarity is that they also use the "Winner Takes All" voting system, in which the person that receives the most votes wins, as opposed to a proportional system used in other countries. Other than that similarity, they're basically entirely different. While I think you're right to say that bad ideas have been given more traction than they deserved by having an effective leader promoting them, I don't think this is a counter-argument to the grandparent. Choosing the country's goals certainly should be democratic, but in an imperfect political system, it still takes tenacious leaders to navigate the rough political landscape to realize those goals. > That sounds more like a primer on how completely awful (in the gas chamber/gulag/killing fields sense) political ideas come about. No, it's how all large-scale political ideas come about. It's just that 90% of them are crap, just like everything else. I see no real correlation between "great political ideas" and their source. You're just as likely to get terrible totalitarian, unworkable, incoherent, or simply misinformed ideas as good ones from any one source (e.g, Ayn Rand & co for an example of a series of well-formulated but relatively baseless ideas). Is it possible that there is no way to predict the quality of these sorts of systems (assuming non-triviality) without actually carrying out an experiment? This idea should be extended to programming languages and computer systems. The success of Unix, C, Perl, PHP, iPhone OS and many other examples of technology is highly dependent on their interaction with pre-existing user communities and technological infrastructure. Take manufacturing. The assembly line is a "great" idea that is useless without many tiny good ideas. Yes, we need common sense more than great ideas. "Unexpectedly, the civic decisions--often involving road, sanitation, and water projects--were nearly identical whether made by majority vote or village elites. Giving power to the people, it seems, does not automatically lead to tangible material changes. Yet when people were allowed to vote, they expressed greater contentment with the results." Honestly, this kind of depresses me. I'd love to see an honest dialogue between government and citizens with well thought out ideas and respect from both sides. However, that's just not happening here. Between the massive influx of immature trolls and the Poe's Law style comments, it seems doomed from the start. The server creaking under the massive weight of traffic certainly isn't helping either. I think a system like this could work with some better moderation, and perhaps a better start to it, but this one doesn't appear to have a future, unfortunately. Edit: I'd also like to add that this article is terrible. The seem to be taking glee in the fact that trolls deliberately poisoned the site, rather than thinking about how this could have been useful. I put the blame as much (if not moreso) on the people trolling the site as I do the nutjobs adding sincere comments. The site was doomed from the moment 4chan heard about it. When are people going to learn that you can't expect online polls and discussions to escape the trolls? There isn't much that can be done about it either or else people would complain about "censorship". >I put the blame as much (if not moreso) on the people trolling the site as I do the nutjobs adding sincere comments. So you'd have more sympathy for someone who is sincerely racist and xenophobic than someone who isn't just because of their sincerity? Why not "put the blame" on the Republican party for being a complete joke. Are there any startups working on a dialog or debate system using FluidDB? I can't tell if this is real or a satirical article. "Rep. Kevin McCarthy (R-Calif.), who created the program, said that to get software for the site, 'I personally traveled to Washington state and discovered a Microsoft program that helped NASA map the moon.'" Upvotes to whoever writes "The Ballad of McCarthy" commemorating this epic quest. Lol, I was trying put into words how silly the man is for thinking that travelling to Washington is in any way talking-point worthy. You nailed it. Epic quest, lol. FWIW, he's probably referring to .NET, which appears to be powering the Republican web site as well as NASA World Wind, which can be used to view lunar data sets. Honestly, they could have just used the Reddit software for something like this. It's open source, and it has basically all the same functionality as this site does. The only thing I can really see that would have to be change would be the user registration, the rest is just changing how things are rendered. Also, their servers were really straining last night. It just absolutely would not load for me. Of course. Besides up-votes, how else could you determine the location of so many craters? I can't either! Does this mean they took apart the software and remolded it to their own purposes (proprietary & doubtful besides), or ar they really using a GIS to show upvotes? They seem to have underestimated the speed at which trolls can ruin everything. This, of course, is why we can't have nice things. I'd have more sympathy, except that attempting to establish policy by soliciting on a public, unmoderated website is a ludicrous idea to begin with. It's got about the same validity as Fox News running a radiobutton poll on their website on "Is Obama really a citizen?" Are you saying politicians shouldn't listen to the people when developing policy ideas? If people actually used such a website in good faith then it could potentially produce some useful ideas and allow them to percolate upwards to party policymakers. They shouldn't blindly pick whatever ideas turn out to be popular on their website, but it might bring up some things they hadn't thought of before. The sad part is they feel a website like this is necessary. They're professional politicians in a democratic country. They should already be in touch with their constituency. They should have a chain of advisement and direction built all the way from local caucuses at the precinct level. And if they were serious about making the project more efficient by taking it online, they should have a registration-based website with registration tied to actual party membership and heavily moderated to allow only articulate arguments. So if I'm in an area that is represented by a member of another party, then my voice deserves less weight than the voice of someone that is a member of that party? If this was a government or public institution website you'd be correct. But it's a website specifically for the GOP to garner ideas. Yes, but in the example we're talking about elected officials. It's their duty to represent everyone in their constituency, not just the ones that are members of their political party. I was of the understanding that this thread had branched to discuss communication at the ground level with your elected representative, not a forum to discuss the direction of an entire political party as a whole. The discussion was just framed around each political party providing their elected officials with a way of communication with their constituents. It's their duty to represent everyone in their constituency, not just the ones that are members of their political party. I'm not sure that's true. In that case, there would be a moral argument against voting for third parties, since they definitely don't represent the views of a majority of people. And there'd be a moral argument against voting Republican in Manhattan, or Democrat in Utah. You can be a Republican in a district represented by a Democrat. Where is joining a particular political party (even 'independent' parties) a requirement for participation in the political process? If it's the political process of that party, they may very well require joining them. I would not trust any politician who says “I have no idea what policies I should be proposing once I get elected, so I want to hear your ideas.” Such a politician is either an idiot or a liar. Indeed. Perhaps the site will provide good data for potential leaders to decide whether to run in Republican primaries? But they don't, which is the point of his comment. After reading some of the comments on their website I have hard time distinguishing trolls from republican talking points. "After reading some of the comments on their website I have hard time distinguishing trolls from republican talking points." Look, can't we come together under the banner of mutual brotherhood and fraternity and agree that Internet trolls can't be held against any political view? Can't we all come together and agree that whatever our differences, at least we can look down our noses at that lot? Do you really think it would be that different if the Democrats had put up the same site? Or Libertarians, or Labour? The stupidity of raw internet conversation transcends political boundaries. Is Conservapedia a giant troll wiki or is it legit? I'm almost convinced it has to be satire. "Commonly Cited Arguments Against Atheism and For Theism", "Atheism and Mass Murder", "Atheism and Immoral Views"
I think you misunderstood me. I abhor all politicians and all forms of fixed political ideology, whether its the liberal, the conservative the libertarians or what not. Any ideology that encourages you to blindly follow a self-imposed moral, with disregard to rationality and reason, or the needs of the present day, is not my cup of tea. But even those ideologies have extremsist, and if you were to actually listen to everyday republican's around you, they sound exactly like most of the comments on that website. This has nothing to do with me not liking republicans but everything to do with what they have actually become. These extreme views might not be the majority (I think they are, but hard to know for sure), but they are definitely the loudest and the ones dictating the platform for the republican party. "We must not stop until the American people win the war on Health-Care [...] Our leaders today are nothing short of Angels. “Gods Elect” put in power by God for his people and his world." I think the point that was trying to be made is that it seems like the majority of Republicans (or at least the majority of the vocal ones) hold views that border on self-satire to the point where you almost can't be sure if someone is trolling or serious. I think that you were be hard-pressed to find someone that believes that the majority Democrats believe that God put their leaders into power. Especially since (at least in my opinion) a majority of America views the Democrats as being associated with Atheism/science (e.g. Creationism vs Evolution). Sorry, I totally feel that way about, say, the economic theories favored by Democrats, or the things that boil down to conspiracy theories in which Wall Street is 110% responsible for every bad thing that ever happened economically (and a good deal of non-economic things) while the pure-as-the-driven-snow government is blameless in all ways, which by the way is pretty much the official platform of the Democratic Party. Of course you're hard-pressed to find a Democrat that believes an internet-troll-republican position. You need to be looking for one that holds an internet-troll-democrat position. If you need help finding them, I suggest the reddit politics board or the comments section on the Huffington Post. Or the comments section on any major newspaper that has comments. Uh, pretty sure most democrats are much more nuanced than the description in your first graf there. Also, unless you were outraged for the entire Bush term of office, and I mean really outraged to the point of voting for Kerry in 2004, you're not a libertarian, you're a Republican. Sorry. I'm pretty sure most republicans are much more nuanced than the morons who post on americaspeaksout.com. I know it's convenient to believe that your political enemies are all stupid and evil, while your allies are mostly pure, good and smart. Go ahead and feel that way if it makes you happier. Sorry man, but I didn't piss in your oatmeal this morning and I certainly didn't say any of that stuff. I complain about oversimplifications and demonization and you come back at me with even more of it? > I think that you were be hard-pressed to find someone that believes that the majority Democrats believe that God put their leaders into power. This is a perfectly well formed sentence, and I can see how it fits into the present discussion, but I have a bit of a poor reaction to it; it seems that I shouldn't have to discuss what I, or anyone else, believe that someone believes. Some Republican politicans have said that God puts their leaders in power (and I wouldn't be surprised if Democratic ones have, too); why does it matter whether or not they believe it, if their constituents do? You're linking to a blog post, not an official DNC site. Anyone can post any tripe they want on my.barackobama.com... Notice the "my" domain name? Anyone can post any tripe they want on americaspeakingout.com. That's the point - any community generated political site will be full of crazy nonsense, regardless of the party behind it. This is what they get for pandering to the lowest common denominator. I was probably going to vote McCain...until I met Sarah Palin. Now, instead of having me wanting to participate in this (and I hope I don't flatter myself by thinking I could make better suggestions than those in the article), they've got, well, Palin fans, and you can't tell the signal from the noise. You've made a troll quality insult against Republicans ("Republicans sound like trolls" without any argument, details, quote, etc). Hmm. Trolling about trolling. Meta irony, I hope? "We should not allow Muslims to enter the country." Is this statement a troll, or what someone actually believes? There's enough wrong with it that I could believe it's a troll, and yet I've honestly met people who would be completely sincere in saying it. Browse around a little more, and you'll find many other statements like it. Part of me hopes it's just idiotic trolls ruining what could have been constructive dialogue, but unfortunately I know that some of these posts are completely sincere. Heh, nice quote, I can't tell! Edit: Yes, I took it to be a real quote. Actually, that's actually a real example I found in the National Defense section. So far, that seems to be the worst minefield for "troll vs true". We need to stop Muslin from getting into this country! That damn loosely-woven cotton fabric keeps getting in here. Yeah, what is sad is it is way too easy to troll in a place like that and come off as sincere as many actual arguments there are just as insane. Should Persia, Syria, Egypt, Pakistan, India, Spain, the Balkans, etc, etc, have allowed Muslims to enter their respective countries? Don't beat around the bush, man. Spell it out for us. What're you saying here? He said that they've become so extreme and fundamentalist that Poe's law applied -- that their own honest statements have reached the point where they look like self-parody. You can agree or disagree, but he definitely made an argument with the Poe's law citation. >After reading some of the comments on their website I have hard time distinguishing trolls from republican talking points. That's indeed the most interesting aspect of the whole story. Right. An intern doing a "sanity/troll" moderating would make it a respectable effort. Well, I did see one comment that said it had been removed due to flagging by the community. So it's likely that they are getting on top of this problem, and that the author of this article just happened to drop by just after a massive troll influx thanks to 4chan or democraticunderground. The article is amusing but unfair - it's mostly just selected quotes from contributors to the new site. One could write a similarly far out (and amusing) story about HN or any other social site, by judiciously selecting from amongst the troll comments. "Today presently in our world you can notice a lot of instability in our Earth’s physic’s. Like now we are having a lot of Earthquakes, Tsunamis, we also have El nino on the equator and now something new like Iceland’s new erupting Volcano and this hasn’t happened since the 18 hundreds. I would also like to talk about how I thing we can possibly repair some of these major problems in a fairly simple way. In my Books Moon People 3, I developed something called the Ecliptic Satellite Tint Shield [...] Now the connection that I am getting at between the "Ecliptic Satellite Tint Shield" and the Earth’s current instability is you can use this satellite on Earth. We could park one right over the volcano in Iceland to where we could adjust the tint shield over the Volcano to eclipse it to cool it off." "The entire Earth gets 70% of all of our Oxygen all over the world from Plankton. Could you imagine what it would be like on our Earth without our normal 70% oxygen in our atmosphere, if all of a sudden all of the plankton in the ocean died. It wouldn’t be pretty, this is prophisized in our Bible." "I respectfully ask The clerics of Iran and the President of Iran to let NATO redo elections for the good of your country[...] I would just like to say one more thing before I go. MELCHIZEDEK'S name means "The KING of RIGHTEOUSNESS and JUSTICE" and the Heart of JUSTICE is FAIRNESS and MELCHILEDEK rules over a "KINGDOM called SALEM" which means PEACE!!!! "MELCHIZELDEK is The MESSIAH and is The CHRIST" and The CHRIST is the son of the Living GOD and his name is JESUS!! !Those who follow him will have ETERNAL LIFE!!!!! " Quit linking to insane blog posts and pretending it comes from an official DNC website. Anyone can create a blog at my.barackobama.com. It's like blogspot. Unfortunately, there is no mandatory mental health screening required to purchase an Internet connection or a computer. I'm not pretending the content I cited was generated by the DNC. I'm pointing out that a site similar to the one currently under discussion, but with the opposite political affiliation, also has nutjobs posting on it. That's not a very surprising fact, but considering the number of people here acting like it's a republican only problem, it's worth pointing out explicitly. Yeah, but you're making a total straw-man argument unless you get into quantity and kind. It appears that the republican website is 99% populated by nutcases, split pretty evenly between republican nutcases and liberal/moderate trolls. That's the point of the original article, along with the insinuation that these sentiments represent the republican base and tea party movement. The existence of 1 (even hundreds!) of nutcases on my.barackobama.com doesn't invalidate the original point or insinuation, even if they're wrong. I think you mean 'fortunately'. A few trolls is a small price to pay for something approximating anonymity and freedom. The humor is not that a social site attracted trolls; the humor is that a major US political party used a social site to solicit help developing its political agenda. The trolls are just helping us see the violence^H^H^H^H^H^H^H^Hfoolishness inherent in the system. Uhm, did you visit the site? I browsed two pages and saw only one suggestion that had both punctuation and was not obviously a troll. PROTECT THE CONSTITUTION: Require each bill to identify the specific provision of the Constitution that gives Congress the power to do what the bill does. So, people really think that it will help to protect the Constitution to write "Article 1, Section 8, Clause 3" on every bill? The court has historically interpreted the commerce clause in such a way that everything is justified by it. The hard part is getting the court to stop doing that, not making Congresspeople write some extra stuff on the bill. It reveals dependencies. People might be concerned if, e.g., 90% of government spending was valid if and only if the commerce clause had a particular interpretation. Companies disclose if a single customer represents even 10% of their revenues, because it's a risk factor. Looking at that would be a great way to create some really perverse incentives. "Let's spend more money on the armed forces and post office, to make the portion that comes under Clause 3 appear smaller." A lawyer I spoke to told me that there's a question regarding federal law on the bar exam every single year, asking "From where is the power to create X law derived in the Constitution?" It's a different law every year, but the answer is always the same: "The commerce clause." Not all trolls are obvious. I saw the site early yesterday and most of the submitted comments were sad and depressing (or complaining about having had a previous post deleted), not ridiculously stupid as the ones highlighted in this article. After Wonkette linked to it, I'm sure plenty of left-leaning people went and had some fun. I was rickrolled on the 7th comment I read. I don't think I've ever been rickrolled on HN. I think they just underestimated the need for moderators. Though I can't really fault them for that, a good moderation system is tough. This is hilarious. I seriously had to check the address bar to see if I was reading the Onion. "both dems and repubs need to gain the trust of the american people both sides have lied to us robbed us and i think both sides are about the money not freedom most of them dont know or care what is in the constitution im not saying all of them but most of the politicians"
"my grandfather told me if you could lie and steal you could be a politician they were write"
Cut them some slack. Managing user generated content is a difficult task. I hope they resolve these issues and bring us one step closer to using the internet to improve democracy. I hope they DON'T resolve these issues and bring us one step closer to using the internet to improve democracy. Moderating comments to handpick what are 'acceptable' views is not democracy. The popular masses trolling a joke of a party to its disintegration, is. A very high volume of Americans are speaking out right now. Please wait a moment and try again. Well, their publicity is working. Try refreshing it once or twice and it should come up. Probably got an influx of people from this site and others visiting it which overwhelmed it. Of all the comments on the site and in this thread, this is the one that made me laugh. 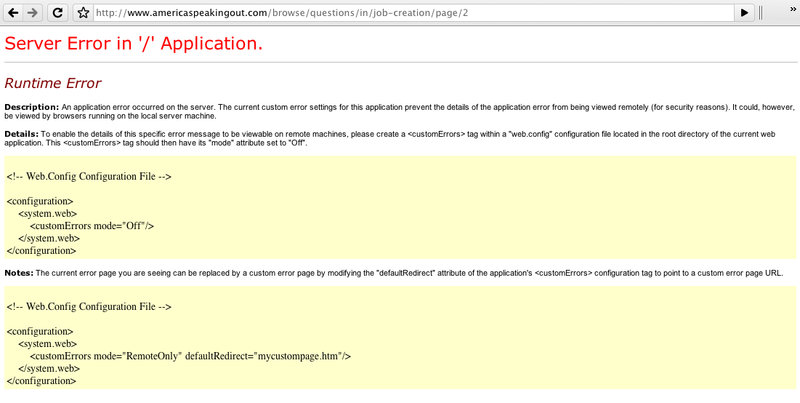 Yesterday all you got was .net error pages. That just means everyone from 4chan is on there trolling away. I would love to know what element of this website is used in mapping the moon. America's number one problem: Lobbyists. They corrupt the political system more than anything else. Solution: Make ALL politicians wear a "Nascar jersey" to work. Every politician should wear clothing with corporate logo decals. The bigger the payoff amount, the bigger the decal. Not a bad idea, but not the best execution. A shame. Interesting - I looked at their WHOIS records to see who actually built the site, and while that wasn't obvious, I did find the site's domain server on sale at Sedo for $300. I wonder how long that goes unpurchased. "Winsome" is not an adjective I have ever heard applied to the design of a website. I need to use that more often. They're trolling for troll-attention. They know the more trolls that come and make funny posting the more attention it will garnish. ..at least I hope that is their plan. Anyway, this site doesnt need software that maps moons, I'm sure it could be done as a weekend project with [your favorite set of frameworks] and some red bull. Also, the trolls will get bored after a few days and move on, but the site will still be there long after 4chan has forgotten about it. It's possible that a genuine community will show up to use the site in the way they intended. If the site hasnt changed policies after it is used in its intended manor, the re-tolling would be that much better. "We should invent and patent more colors. Like fuchsia, but not that because it's already been invented." "Nationalize production of "Arrested Development" and reap the profits of the show owning." "Did Glenn Beck assault a young girl in 1990?" "Americans die in hurricanes and tornadoes. It's time to declare a War on Weather." "1500 characters maximum is hardly enough to explain the extent of failure that this website has enabled." 1. Have an idea for one of those newfangled web 2.0 things. 2. Hire someone to write it. 3. ??? 4. Profit! They had to go to Microsoft to get this? Reddit is open source. But I'm guessing they see open source as anti-american. Well, considering most of the government uses a Microsoft stack I'm not surprised. Besides, their categorization is pretty well-done. Reddit and sites such as this one are harder to use for people who don't write software or regularly browse the internet. (And, considering Stackoverflow is based on a Microsoft stack very similar to this site, it's slightly silly. Pick the right tools for the task and a dev stack you enjoy). Don't you get it? Reddit is pro-Obama, so obviously they couldn't use this communist rubbish. True patriotic capitalists use proper respectable Microsoft software for everything. I guess you have to try harder to get your humour across. They should have just started a thread on 4chan. It would be faster I think. Headline should have been: New website can also help NASA map the moon. I have a sneaking suspicion that Poe's Law is in full effect here. Somebody take screen shots of all these comments for posterity! "A 'teacher' told my child in class that dolphins were mammals and not fish!" a third complains. "And the same thing about whales! We need TRADITIONAL VALUES in all areas of education. If it swims in the water, it is a FISH. Period! End of Story." If you believed that was a real comment then You Have Been Trolled. And here was I thinking "Man, these trolls are way too obvious, they should have gone with something more subtle". To be fair, I'm sure most of the suggestions on that site were made by trolls. But the quotes from the some of the representatives themselves are almost as crazy. Be it known that, waiving all argument, I take the good old fashioned ground that the whale is a fish, and call upon holy Jonah to back me. This fundamental thing settled, the next point is, in what internal respect does the whale differ from other fish. Above, Linnaeus has given you those items. But in brief they are these: lungs and warm blood; whereas, all other fish are lungless and cold blooded. Sounds like they're almost certainly making fun of many republican's views on evolution. Republicans make website, get trolled hard, news at 11. Did they choose not to use open source software because it was socialist?